Mariner 9 took this picture of Mars at 3:38 a.m. PST, November 11, 1971., during its approach to the planet. The south polar cap (at the bottom of the planet disc) shines dimly through the apparent atmospheric haze, probably dust. This was the fourteenth picture taken during a 24-hour series of Mars surveillance photos. 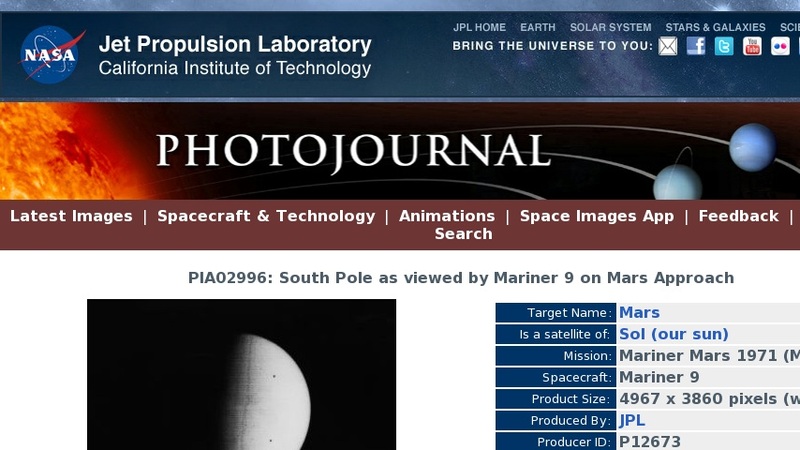 The picture was taken with Mariner's narrow-angle camera from a distance of 445,000 miles. The "dust storm" has obscured the usually prominent Martian surface features from ground-based observers for several months. Mariner 9 was the first spacecraft to orbit another planet. The spacecraft was designed to continue the atmospheric studies begun by Mariners 6 and 7, and to map over 70% of the Martian surface from the lowest altitude (1500 kilometers [900 miles])and at the highest resolutions (1 kilometer per pixel to 100 meters per pixel) of any previous Mars mission. Mariner 9 was launched on May 30, 1971 and arrived on November 14, 1971.